Summary: 11eyes. Since losing his sister seven years ago, Kakeru Satsuki has led a vacant life. He has only been able to return to normal with help from his childhood friend, Yuka Minase, and other friends at school. Then one day the sky turns red, the moon turns black, everyone around Kakeru and Yuka disappears and monsters start roaming the streets. This virtual world is nicknamed “Red Night” by the pair. 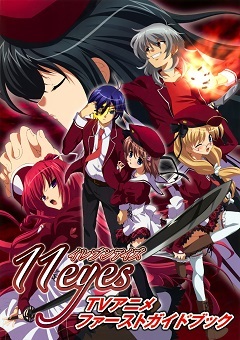 After several more incidents, they find four other humans affected by this mysterious phenomenon: Misuzu Kusakabe, a red-haired onmyouji swordswoman; Kukuri Tachibana, a strange mute girl who resembles Kakeru's deceased sister in both looks and name; Yukiko Hirohara, a lively young girl who takes on the personality of a cold killer when her glasses are removed; and Takahisa Tajima, a young pyrokineticist with a heated attitude to boot. Kakeru wants to protect Yuka in return for her constant support and kindness, but is unable to awaken his own hidden power, which Misuzu promises will eventually appear. The six of them band together to survive with their special powers, but are soon targeted by grotesque creatures nicknamed “Black Knights” whose ultimate goal is to kill them. The plot thickens when the teenagers find a girl named Lisette trapped in a red crystal guarded by the Black Knights, who begs them to save her from this prison. What is the mystery behind this mysterious phenomenon of Red Night? Who are the Black Knights, and how are they connected to Lisette? Furthermore, is Kukuri's resemblance to Kakeru's dead sister really coincidence? What about Yuka and Kakeru's powers?